Morph into your favorite hunter and battle your way through the Hell of Deadly Poison! 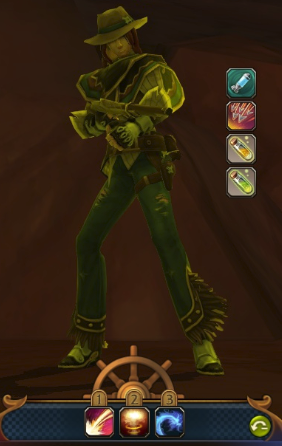 Use Kerse's skill with a gun to defeat familiar foes and earn new prizes! Visit Maden in Bouquet Town before you enter the dungeon. She has daily quests for all solo dungeons. The new quest, Cave of Queen Ant, requires you defeat Maya and rewards you with 84 diamonds. 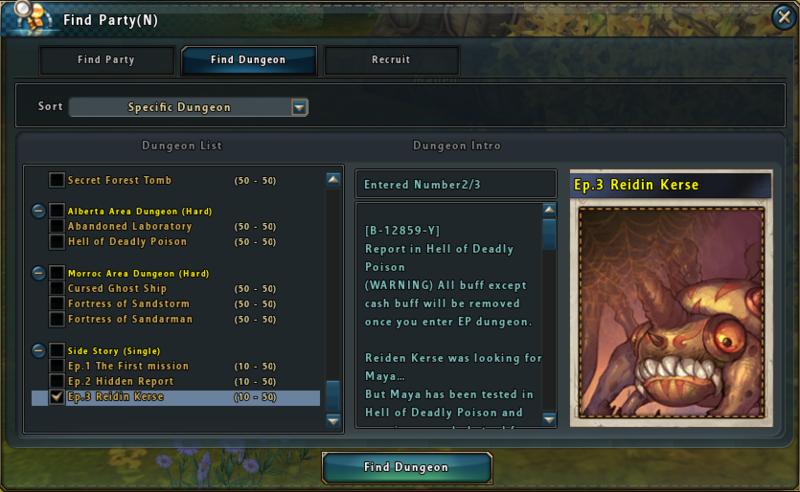 You can enter the dungeon by pressing "N" and clicking the "Find Dungeon" tab. Check the box for Episode 3: Reidin Kerse and begin the dungeon by pressing the bottom "Find Dungeon" button. You will fight in the dungeon as Reidin Kerse. He has a set of main skills, as well as clickable on-screen health potions, reload skill, and AoE damage skill. Gives damage to a single target. Consumes 1 bullet. Gives damage to up to 5 targets and decreases their movement speed. Consumes 3 bullets. Reload: 1.5 Second Cast, No Cooldown. Reload 10 bullets. Can be applied twice, up to 20 bullets. Damage up to 20 hostile targets within 17m of the target. Consume 5 bullets. Potion Drink (L): Recover full HP. Instant Cast, 60 Second Cooldown. Potion Drink (S): Recover 2200 HP per second over 10 seconds. - When you enter the dungeon, all buffs will be removed except for Elite Membership, Norn's Blessing, and Midgard's Grace. The dungeon is auto-balanced for difficulty. 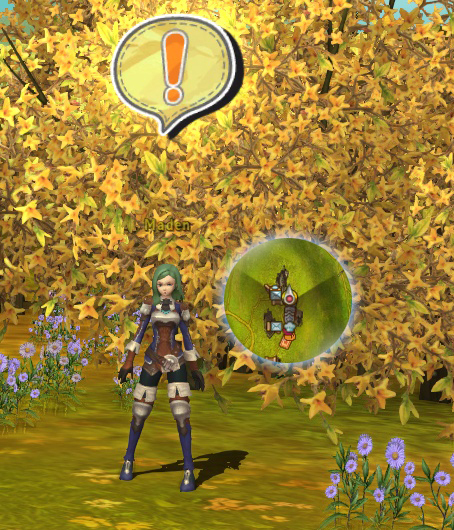 - The explosion skill places a DoT on the targets and slows them. Use your Backward Roll skill to keep your distance! You don't have to face your enemy to use explosion or single shot.